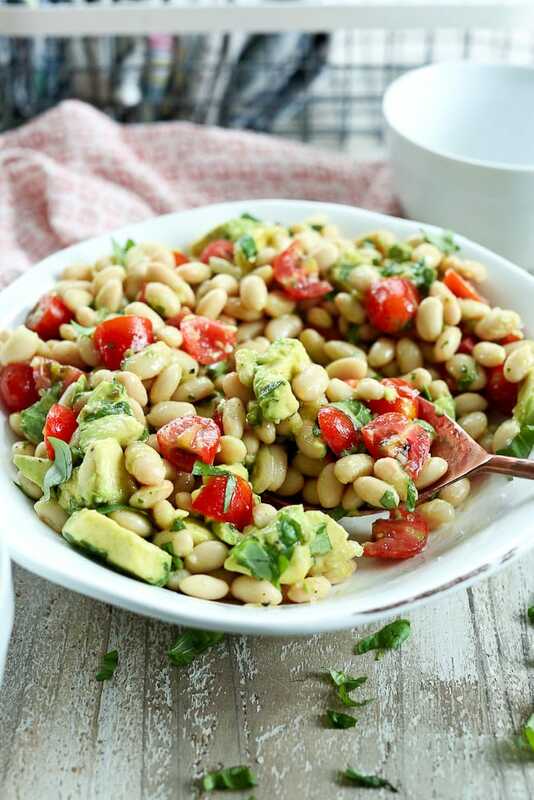 White Bean Salad is the perfect answer to what to make for a quick dinner side dish or your next potluck picnic! Heads up! This post was first published May 2014. Updates were made May 2018. Enjoy! Last week, we were supposed to attend a family picnic for Meghan’s school. In a bit of a rush, I whipped up this white bean salad to bring along. Then, the storm clouds rolled in and the thunder and lightening put on a show that cancelled the picnic. I ended up eating a giant bowl of this salad for dinner. Then I had some more. I kept thinking about it everyday since then, so I made it again for dinner a few days ago. 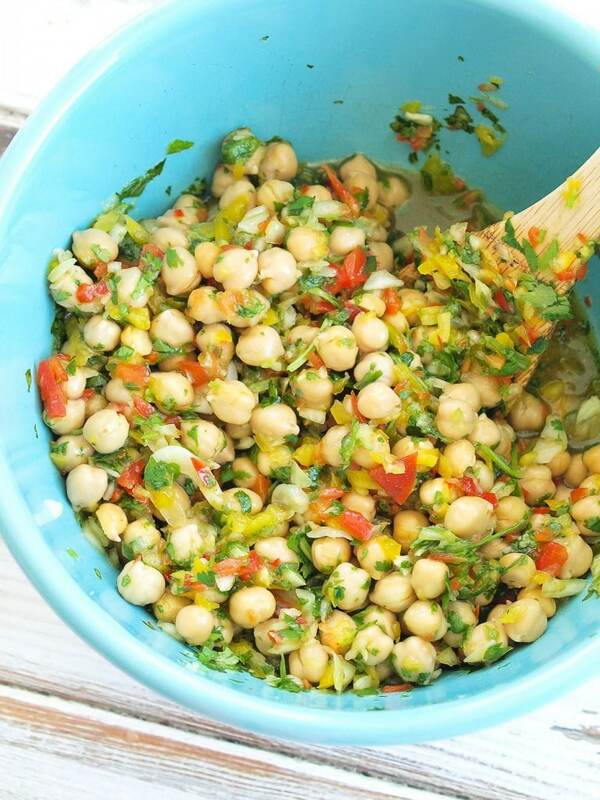 I will make this white bean salad again and again this summer, so I knew I had to share it with you. I pretty much think fresh basil can do no wrong. This salad is bursting with fresh basil and it just reminds me of summer. 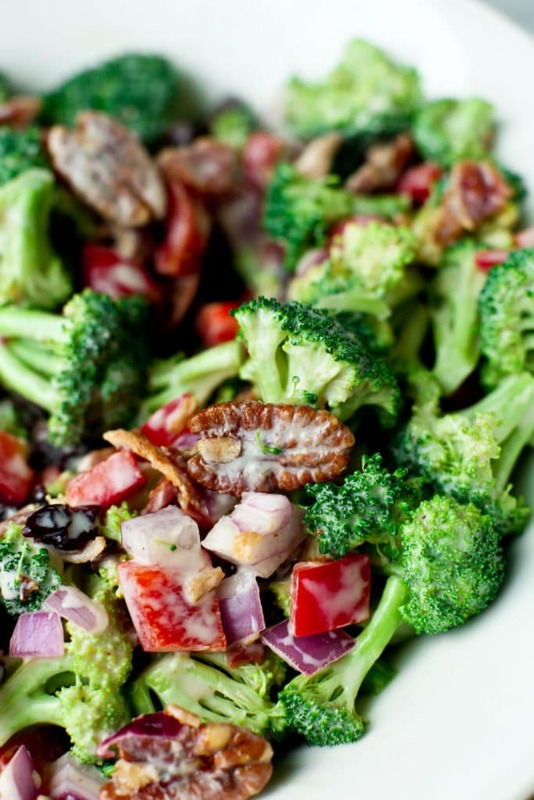 What a great salad to eat on the weekend that kicks off summer. 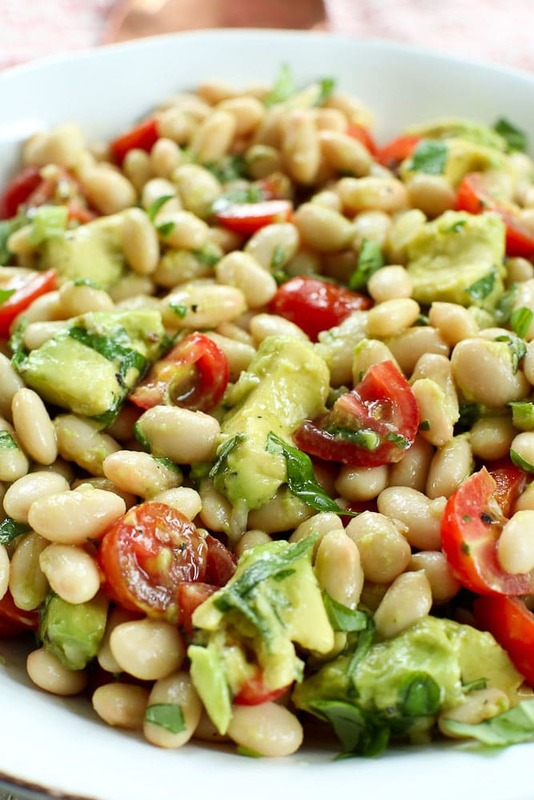 I hope you enjoy this White Bean Salad as much as I do! 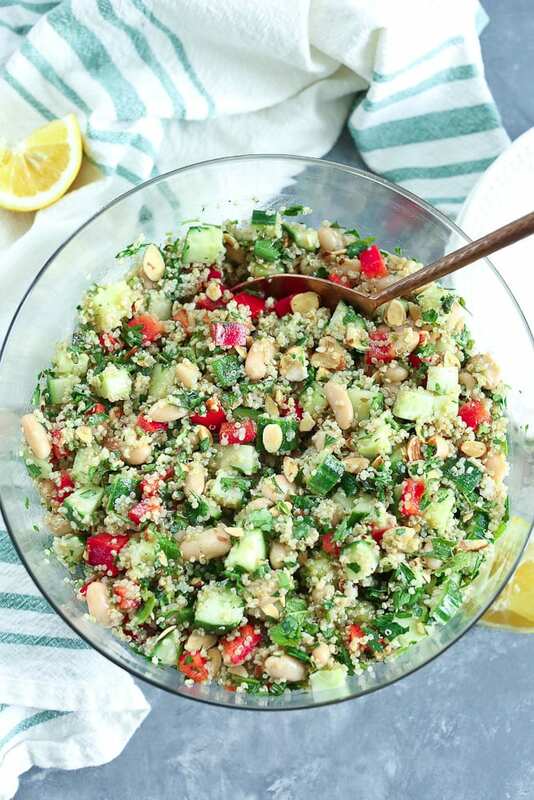 This vegan, gluten-free, soy-free, and nut-free salad is quick to throw together, healthy, and full of flavor. It’s a perfect party salad! In a small bowl, whisk together the olive oil, lemon juice, salt, pepper, and garlic. Set aside. In a medium bowl, gently mix together the beans, tomatoes, avocado, and basil. Drizzle the dressing on top and gently mix again to coat the salad. Enjoy! *This recipe originally called for half of an avocado and half of a cucumber. Over the years, I left the cucumber out and used a whole avocado more often than not. If you prefer, add some cucumber slices! It’s good either way. 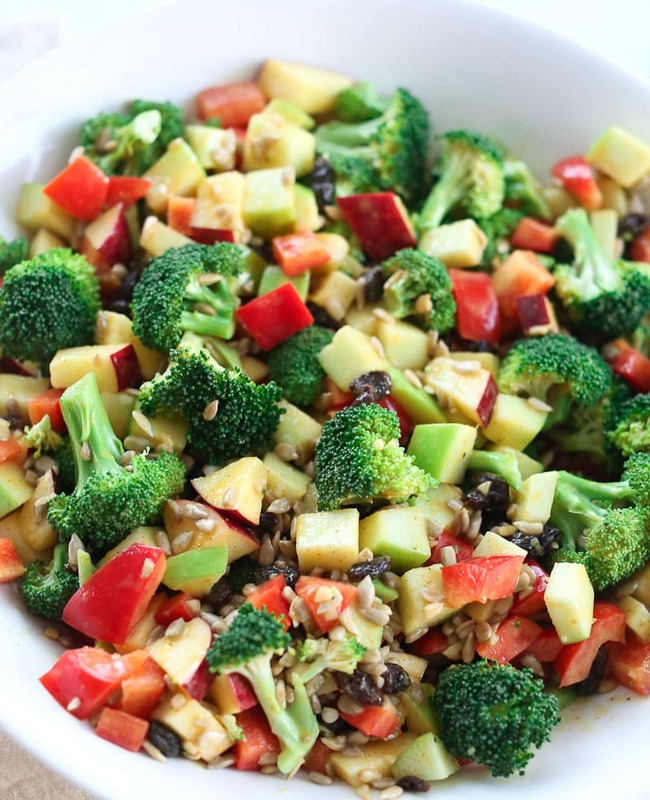 Want more great salad recipes to bring to your next picnic or potluck? Here’s some inspiration! Fresh basil can do no wrong! Always looking for new bean recipes for summer. Plus, bathing suit season it upon us! Ironic, I made a lime-vinaigrette corn salad last weekend for a get-together, and then the wife of the hosting family came down with a sore throat, so we couldn’t get together. That’s what I ate most of the week and plan to make that salad over and over again this summer, because it’s so tasty, refreshing, and easy to throw together. Easy to throw together–the best kind of salads! Oops I should have included the number of servings! I’ll fix that right away. This makes about 8 servings as a side or starter. Could i make this night before? Always concerned how to keep avocado from browning. You can make it the night before, but I would leave out the avocado until you are ready to serve it. I would add the avocado the day you want to serve it as it will probably not look as appetizing if you add it the night before. Yummy! I love everything in this! Your recipe doesn’t say there is zucchini in there but I think there is, right? Ok..I went to edit it and saw that cucumber is listed it was just formatted strangely and there was no space in between ingredients. Anyway, I hope this didn’t cause problems for you. Can you use any bean? Like Black bean or a Cannellini bean?